Back when I was still a kid writing Star Trek fan fiction, there were only four Star Trek TV series and ten movies. No Discovery, no Kelvin universe or any of that other snazzier, slightly darker stuff we’ve been getting served recently. And now I hear that they’re expanding the franchise even further, with more shows and films, including a new Captain Picard show. Now… I don’t want to knock the new stuff. Most of it is quite good in its own way. But if I have one criticism for them all, its that they lack that cheese, that optimism, that je ne sais quoi that made Star Trek, Star Trek. They’re just a bit to grim. Too serious. Dare I say, too cool. And for that reason, I’ve got my doubts about this new Picard show. I’m fearful that it’s going to take one of the franchises’ most beloved characters and ruin him. And so, for the benefit of any would-be Star Trek writers, I have compiled this list of five basic Star Trek plots to help you on your way to writing a traditional, cheesy Star Trek story. In Star Trek, the transporter is a ‘completely safe’ device which breaks an object or person down at the molecular level and re-materialises them on another ship or planet. Lots, apparently. It turns out that a dicky transporter can leave you with stones embedded in your body (ENT: “Strange New World”); separate your ‘good side’ from your ‘evil side’ so that you become two separate people (TOS: “The Enemy Within”); beam you up naked (VOY: “In The Flesh”) and re-materialise you as a child (TNG: “Rascals”). Remember, would-be Trek-writer, the transporter is a treasure trove of light-hearted nonsense with which you can easily fill up an hour with. Sometimes, perhaps due to an alien seizing control of the ship, because we entered a wormhole or because somebody accidentally broke the ship’s engines, we’re now moving even faster than we ever thought possible. The burst of speed only lasts for a moment, and naturally the first thing to do is figure out where we are. But wait… this must be a sensor malfunction. But it’s not! You’re three or four galaxies away from where you started (TNG: “Where No One Has Gone Before”)! You’ve ended up in front of a terrifying new antagonist (TNG: “Q Who?”)! You’ve mutated into an amphibian and had amphibian babies with your amphibian captain (VOY: “Threshold”)! How will we ever resist the mind-altering properties of this weird place?! How will we escape the terrifying aliens?! How will we ever look Captain Janeway in the eye again!? There you go. There’s your story. We’ve Been Unwittingly Killing/Enslaving Intelligent Lifeforms! It’s life Jim, but not as we know it. And that’s our lame excuse for hunting it like vermin (TOS: “The Devil in the Dark”), destroying its natural habitat (TNG: “Home Soil”) and forcing it to carry out dangerous or degrading tasks for us (TNG: “The Quality of Life”). The creatures declare war on humanity and almost destroys the ship. The climax consists of a stand-off between humanity and the new lifeform in which only a last ditch attempt at diplomacy can save the day. A few frightened/unbelieving humans (usually guest stars) propose a course of action which will destroy the new lifeforms, resulting in a conflict between themselves and the regular cast, who are more enlightened and realise that killing is wrong. No Star Trek series is complete without at least one time-travel episode. The crew’s odyssey through time is often (though not always) involuntary and, more often than not, it will involve correcting a significant change in established historical events. Sometimes this change will have been brought about by a malevolent force who is deliberately interfering in history (e.g. : DS9: “Trials and Tribble-ations”; VOY: “Relativity”) while other times it will be the regular cast themselves who have accidentally changed by history simply by being there (e.g. : TOS: “The City on the Edge of Forever”; DS9: “Past Tense”). There are exceptions, of course. Star Trek IV: The Voyage Home paid precious little attention to the continuity of the time-line (the crew invented transparent aluminium early, took a native back to the 23rd century and regrew a woman’s kidney without a second thought). So by all means, have fun with time-travel. Budget drying up? Try writing a court-room episode. These feature hardly any flashy effects and are mostly dialogue-driven. It’s nearly always a member of the regular cast who has either been wrongly accused of some offence (TOS: “The Wolf in the Fold”, TNG: “A Matter of Perspective”, DS9: “Inquisition”) or else is fighting for their basic rights (TNG: “The Measure of a Man”, VOY: “Author, Author”). However, there are exceptions. Sometimes its a guest character who’s on trial with the emphasis being placed on the character’s main advocate, who is usually a member of the regular cast (TNG: “The Drumhead”, VOY: “Distant Origin”). Someone Is Violating the Prime Directive! The Whole Crew is Going Mad! The Whole Crew has Caught a Plague! There’s Klingons/Romulans/Jem’Hadar/Borg on the Starboard Bow! There’s an old saying I tend to adhere to: you need to use the right tool for the right job. For me as a writer, that means I have lots of different writing tools depending on the kind of writing I’m doing and what stage of the writing process I’m at. For instance, I use Scrivener to write my novel and other large projects; Hemingway Editor for times of editing; Jotterpad to scribble notes and song lyrics on the go (you didn’t know I wrote music too, did you?) and FocusWriter for short and flash fiction, which is the subject for today’s little review. There are, of course, plenty of “distraction free writing environments” out there. In fact, even the other apps I mentioned at the start of this post boast distraction free modes which hide most or all of the toolbars to allow you to focus exclusively on your words. What sets apart FocusWriter from these, however, is how highly customisable that environment is and how many features of a typical word processor are still available without being intrusive. Personally, I sometimes find that even the best distraction free interfaces can be a little too sterile when it’s just you and the blinking cursor on a blank screen, daring you to write a word. With FocusWriter, that’s not a problem. You can make the interface as pretty or as sterile as you see fit. When you first download the app (for free, I might add, though you can give a “tip”), you will find it is already preloaded with a selection of themes. Some, such as the ‘old school’ theme are very plain featuring nothing but plain text on a plain background. Others include background images and coloured pages for your text to appear on (as you can see from the screenshots below). If none of these themes are to your liking, you can customise them by changing the font; margins; line-spacing; text background colour and opacity and much more besides. You can also create, save and export your own themes using (or not, if you prefer) images from your own library. There is a traditional toolbar and a selection of menus at the top of the screen which includes all the basic features you would expect from a word processor; however, this is all invisible except when you hover the cursor over it, thus giving you easy access to all the basic features without getting in the way while you are trying to write. There is also an option to grey out all text save the sentence, sentences or paragraph you are working on. Personally, I have not found much use for this feature but I suppose I can see why it might help you to focus on a particularly troublesome few sentences, especially if you decide to edit your work with FocusWriter. And of course, there is also the option to make FocusWriter full screen. For those of us who like to keep careful track of our progress or who find it helpful to time ourselves as we write, FocusWriter also includes features for setting yourself daily word count or minutes-spent-writing goals. Again, this is not visible on the screen unless you hover your cursor over the very bottom of the window, where a tiny little bar will appear and tell you your exact word count and how close you are to achieving your daily goal. If you wish, you can also record your progress so you can see how often you are reaching or exceeding your goals over a longer period of time. If you wanted to, you could probably easily use this application to write almost anything, including novels and other long and complicated works. However, I personally find it most useful for writing shorter works, such as short stories or flash fiction. It’s easy to create a different theme for every day and every mood so that your productivity is never hindered by niggling distractions or the pure white horror of a completely blank screen, no matter what kind of person you are and no matter how you feel. The main reason I don’t use it to write novels is because, unlike Scrivener, it is not so easy to gather together your notes and story bible all in the one place. In general, you will be focusing on one document at a time, but sometimes, that’s all you need. Personally, I don’t really like using Scrivener for short stories or microfiction because I find it can be a bit too cluttered, when all I really need is space to write. Other features include (but are not necessarily limited to) a spell checker, ‘smart quotes’ which manages how you use quotation marks throughout the document (personally I’m yet to find a use for that) and ‘sessions’; an interesting little feature which remembers which document(s) you had opened and which theme you were using so that they’re already opened and waiting for you the next time you open FocusWriter. 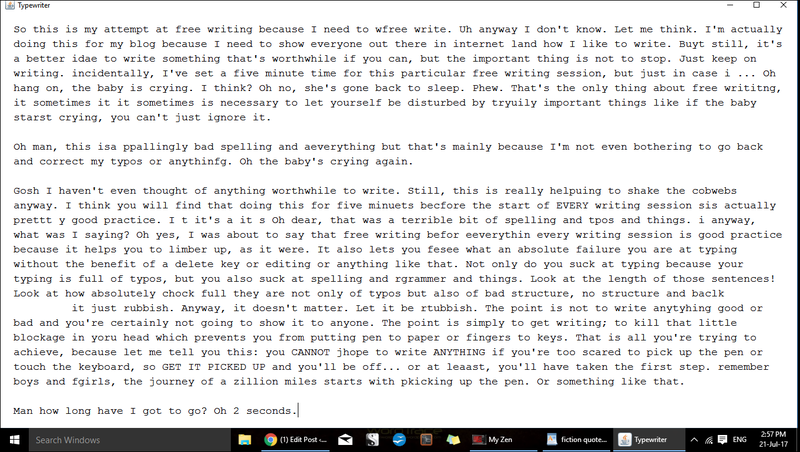 All in all, I think it’s a fantastic app and well worth a look for anyone who’s serious about writing. It’s a real favourite of mine which I use often; far more often than some of the other apps I’ve given written positive reviews about in the past. And did I mention it’s free? Well it is. So go have a look. I think you’ll be pleased.